The completeness of our kits sets them apart from virtually every other kit currently on the market. Included in the complete kit are headers, intake, intercooler and piping, fuel pump, injectors, oil-lines, power steering lines, and all the hardware needed to properly integrate a larger turbo into the engine bay. Again, we use a pre-tuned Unichip computer to give the end user a true plug and play tuning alternative, eliminating costly and time consuming dyno time. Introducing the GPMoto GT32 turbo kit for late-model turbocharged Subaru’s. Designed for quick spool-up, big torque and big power, this kit is the most complete kit on the market giving you the total package for reliable and consistent power delivery. Hardware: At GPMoto we feel that a turbo kit is more than just a big turbo and a up-pipe; it is a complete engineered kit designed and tested to make reliable power. All stainless steel header and downpipes are standard for maximum durablity. The 100% tig welded exhaust parts are not only good to look at but have maximum strength for the years to come. Braided oil lines ensure trouble free operation, while high temp couplers insure a leak free and durible intake system. 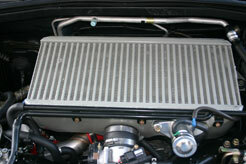 Even the airfilter is designed for long lasting use, as its easy to clean and re-oil when needed. Installation Hardware: Ancillary parts like oil lines and brackets are essential when installing your turbo kit. The GT32 kit will come complete with all the brackets, clamps, oil-lines and hydraulic tubing to make your kit work right. There are no trips to the hardware store and no searching off-size clamps and bolts with this kit. All the pieces needed to make this kit a true bolt-on affair will be right in the box. Not included but reccomended is a Apex-i AVCR. We currently offer a complete parts lineup for every turbocharged Subaru on the market. Whether you are looking for a few more ponies out of your STi, or you are building the ultimate sleeper with your Forester XT, GPMoto has you covered with everything from short ram intake pods to full turbo upgrade kits. Looking for big power? GPMoto offers several staged packages for taking the basic setup Subaru provides to its limits. Wanting more than that? GPMoto offers a wide variety of rotated mount turbo kits featuring a exclusive 4-2 one piece equal length header that maximizes the performance with a minimum of fuss. The GT32 kit is perfect for AutoX and street duty, with the GT32X Kit offering extra power with a minimum of extra lag. The GT40/37 Kit rewards those who are willing to go the extra mile for BIG power. Need tighter handling? GPMoto offers strut bars, sway bars and end links and 15-way adjustable coilovers to give you all the control you need. GPMoto is proud to announce sponsorship of Irish Mikes Racing and their WRX entry into the World Challenge Touring Cup. Click here for proper Oil information.